Himouto! 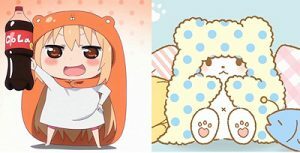 Umaru-chan X Marumofubiyori Coincidence? Marumofubiyori Also know by his nickname, as Mopu is a one of Sanrio’s latest creations. He is a young anthropomorphic Polar Bear living at one of the Zoo Keepers home. He is known for his laziness wanting to just to chill out and sleep in. While Marumofubiyori has been released in Japan recently Sanrio released subs of the first few videos, in a promotion to release Marumofubiyori items in the US. Like Umaru, both wear hoods or blankets and both are lazy at home, and often scolded by their caretakers for being too lazy. In one video, Marumofubiyori was tasked to go out to buy a can of curry powder for dinner; instead, he orders it on Amazon. In other news Aggretsuko, our favorite 20 something death metal singing Red Panda has been picked up by Netflix for a series of 15 Anime epodes. I Hope they will be good and wonder will this Sanrio X Netflix corroboration mean Netflix will pick Hello Kitty, Friends, and other shows. 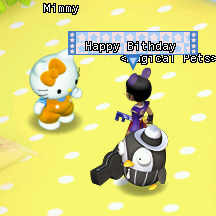 I know I am late to the game, but I want to wish Kitty and Mimmy White a very happy birthday. Normally I would go on Hello Kitty Online, but it has been reported that the service has ended and the servers been taken down. The slow decline of Hello Kitty Online deserves a separate blog post. I neglected my blogging duties due to I was busy with the stress of finding a new job and I was almost homeless but I am back now. 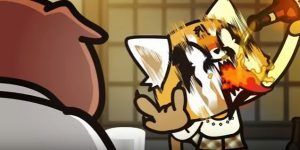 Aggretsuko is one of Sanrio latest Furry characters. She is a cute Red Panda, 25 years old, and a worker at a respected trading firm in Tokyo. She has to deal with a lot of office politics, a condescending boss, and backstabbing and annoying coworkers. When she reaches her limit, she lets off steam via death metal singing and karaoke. 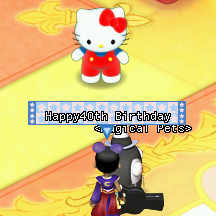 She is cute but definably not like Hello Kitty. A Little misinformation if in the media that Aggretsuko is a boozer. This misinformation came from a screen shot from episode five of Aggretsuko shorts shown on YouTube. While no English sub existed, I could still get the gist. In this episode Aggretsuko was at the bosses after work party know in Japanese culture as a Nomikai. At the party, food and a communal bottle of beer are offered. Nomikai etiquette dictates no glass left empty and you do not fill your glass but you fill the glasses of others also, the lower rank worker serves the upper rank. In this case, the boss set off Aggretsuko by criticizing her for filling his glass with the beer label down. She fantasies insulting and defying the boss by guzzling the beer in front of him. I think it is interesting how Sanrio is marketing Aggretsuko in Japan and the US. Most Sanrio characters start out like Hello Kitty; first being marked to the little Girls, then evolving the market to include Women and now for Hello Kitty to Men. In Aggretsuko case, she is marketed straight to adults. I feel she has a lot of potential worldwide represent the feelings of many over worked individuals and dealing with work place politics. I spoke to soon in Episode 50 Aggretsuko get a little tipsy during a Cherry Blossom outing.